Naperville North warms up before the first inning of Wednesday’s DVC game. Naperville North’s Caitlyn Warren was hoping to make a statement when she stepped into the batter’s box to lead off the eighth inning of a scoreless game against West Aurora on Wednesday. The senior center fielder made it loud and clear, pounding a home run over the center field fence to put the Huskies up 1-0. 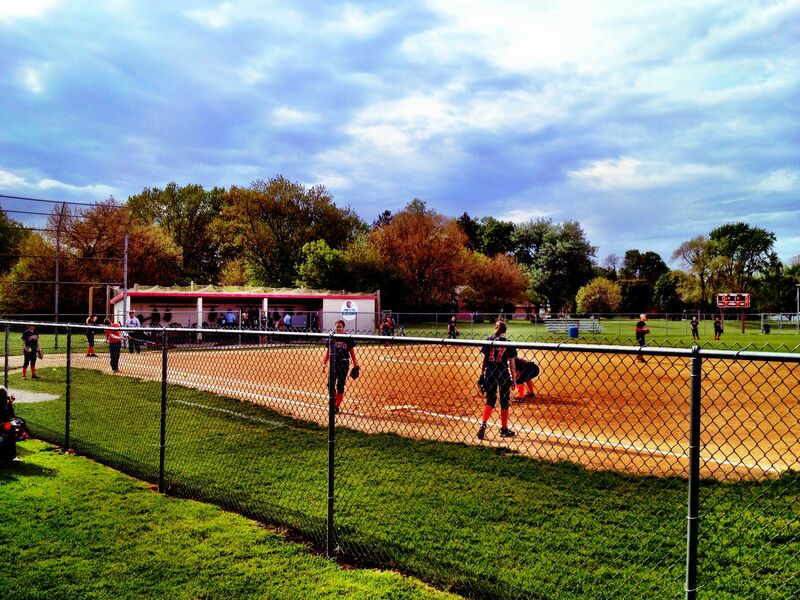 Pitcher Kathleen Hahne worked out of a bases loaded jam in the bottom of the inning as Naperville North hung on to defeat West Aurora 1-0 in a DuPage Valley Conference game. After Warren gave the Huskies the lead in the eighth inning, West Aurora looked poised to tie the game or take the lead in their half of the inning. Racheal Williams and LaRi Mitchell led off the eighth with back-to-back singles. Both runners then advanced on a passed ball and the Blackhawks had runners at second and third with no outs. After Ally Wayzer flew out to right field for the first out of the inning, Julianna Evischi reached first base on an infield single but neither Blackhawks runner advanced. With the bases loaded and one out, Hahne buckled down. The senior pitcher got the second out when she fielded a ground ball off the bat of Alexis Harkless and threw home to get Williams. Hahne then got Molly Jordan to fly out to center field to clinch the fourth-straight victory for Naperville North (13-5, 4-1). West Aurora (6-17, 1-4) pitcher Kaylee Hayton also had a stellar performance, giving up one run, seven hits and three walks in eight innings. Hayton had help from her defense, especially Mitchell in center field. With two runners on base in the sixth inning, the lightning-quick Mitchell made a leaping catch at the wall on a dead-run to rob Kailee Budicin of an extra-base hit. “When we made that catch, I kept telling the girls we can’t lose this game. With defense like that, they deserved to win,” said West Aurora coach Randy Hayslett, who took over the post last week when Sara Nagy resigned. I wrote this story for the Chicago Sun-Times, Naperville Sun, Aurora Beacon and yourseason.com. It appears here.